James Dean was born on February 8th, 1931 in Marion, Indiana. His hobbies were writing, painting, bullfighting (when did that happen? ), photography, sculpting, car racing, horse racing and playing the bongos. His favorite drink was coffee and his favorite ice cream flavor was coffee and raspberry. "To grasp the full significance of life is the actor's duty; to interpret it his problem; and to express it his dedication. Being an actor is the loneliest thing in the world. You are all alone with your concentration and imagination, and that's all you have. Being a good actor isn't easy. Being a man is even harder. I want to be both before I'm done." 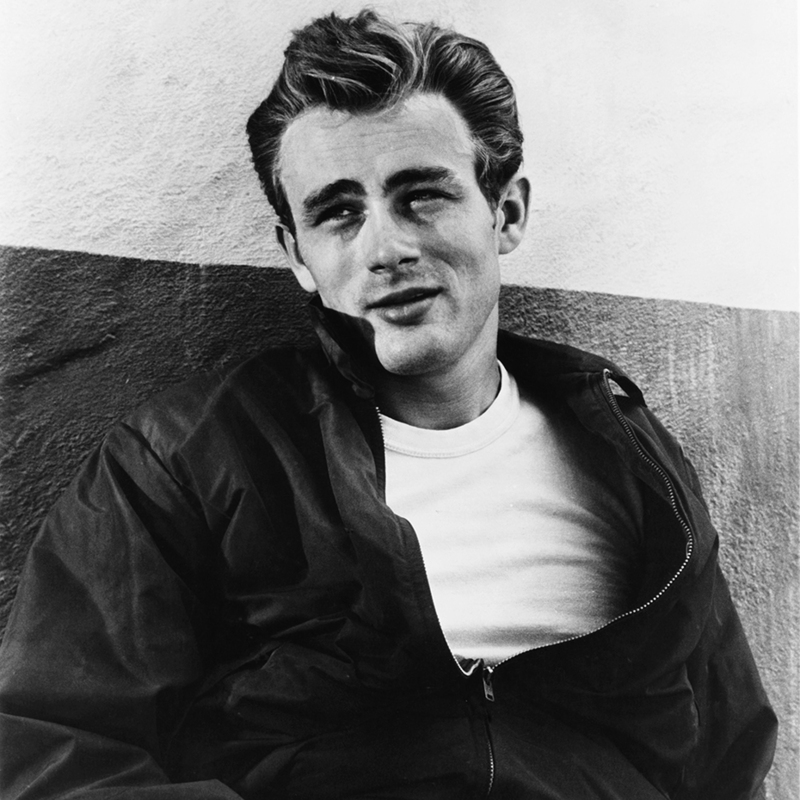 James Dean's first professional acting gig was a Pepsi commercial. Since then, Michael Jackson, Cindy Crawford, Michael J. Fox, Shaquille O'Neal, Jeff Gordon, Ray Charles, Billy Crystal, Britney Spears, Beyonce, Shakira, The Osbournes, Faith Hill, Sammy Sosa, Joe Montana, Ken Griffey Jr., Gloria Estafan, Tina Turner and many others have endorsed the blue canned beverage. Before Pepsi was called Pepsi, it was called "Brad's Drink" way back in 1898. Well, another Brad, Brad Pitt is now vying for the chance to remake James Dean's first film, "East of Eden" with Pitt in the starring role. Dean's performance in "East of Eden" won him an Oscar nomination, making him one of only five actors to receive a nomination from their first screen performances. He was also the only actor in history to receive more than one Oscar nomination posthumously. "Studying cows, pigs and chickens can help an actor develop his character. There are a lot of things I learned from animals. One was that they couldn't hiss or boo me. I also became close to nature, and am now able to appreciate the beauty with which this world is endowed." Dean was required to wear glasses while driving as he was nearsighted. The king of cool, had to wear glasses, if only he had been around long enough to do a public service announcement for that, then being a "four-eyes" would have meant a completely different thing these days. No matter what kind of music James Dean listened to, he liked it LOUD! But what did he listen to? After all it was the early 50's and Elvis had yet to become the King, the Beatles had yet to become the Fab Four...What did James Dean rock out to, before there was Rock? He liked African Tribal music, Afro-Cuban songs and dance (Dean liked to play the bongos), Classical music - especially Bartok and Stravinsky, Judy Garland, Frank Sinatra and Billie Holiday. "When an actor plays a scene exactly the way a director orders, it isn't acting. So the director's task is just that, direct, to point the way. Then the actor takes over. And he must be allowed the space, the freedom to express himself in the role. Without that space, an actor is no more than an unthinking robot with a chest-full of push-buttons." It has been said that James Dean's favorite song was Billie Holiday's "When Your Lover Has Gone" and his favorite album was Frank Sinatra's "Songs for Young Lovers". "An actor must interpret life, and in order to do so must be willing to accept all the experiences life has to offer. In the short span of his lifetime, an actor must learn all there is to know, experience all there is to experience, or approach that state as closely as possible. He must be superhuman in his efforts to store away in the core of his subconscious everything that he might be called upon to use in the expression of his art." Dean only made three Hollywood pictures,playing uncredited roles in four others, propelling him into super stardom. As his final film, Giant, was wrapping up in Marfa, Texas, Dean was driving his Porsche Spyder to an auto race in Salinas, California. His car collided with another car outside Cholame, California. James Dean, an American legend, died on September 30th, 1955. The Failure Analysis Associates later re-created all the details of the accident at the same approximate time on September 30th, and concluded that James Dean was traveling 55 to 56 m.p.h. when the fateful accident occurred, thereby proving he had not been speeding, despite the fact that he had received a speeding ticket only two hours before the crash. "Jim Dean and Elvis were the spokesmen for an entire generation. There was a saying that if Marlon Brando changed the way people acted, then James Dean changed the way people lived. "Every time I go to Europe, I remember that James Dean never saw Europe, but yet I see his face everywhere. There are James Dean, Humphrey Bogart and Marilyn Monroe windows of the Champs Elysees, discos in the south of Spain, restaurants in Sweden, t-shirts in Moscow. My life was confused and disoriented for years by his passing.